Shield your porch, patio, balcony, pergola, lanai, etc. from rain, snow and high winds. You will "keep the view" and be protected too! When selecting the proper screen, view and air flow needs to be considered as well as making sure that the screen is providing sufficient protection for what you require. 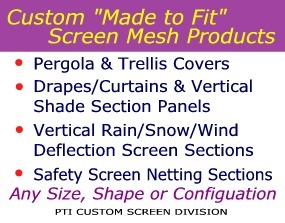 How Screen Mesh Materials Block Rain, Snow & High Winds. Snow is self blocking. The first few snowflakes begin to form a crust on the screen and after the crust is formed, the snow cannot penetrate. Air and soft breezes will flow through the screen easily. High winds, however, become obstructed due to the density of the screen. The force driving those winds is absorbed by the screen and the wind stream is veered off in other directions. Blocking rain is dependant upon several factors. When rain hits the screen it is broken into smaller droplets. Depending upon the angle of the rain, the wind force behind it and the density of the screen, some mist will come through the screen. However, the majority of the water will slide downward. The mist that does come through will have lost momentum and usually penetrates no more than a foot or two. Selecting the screen density should take into consideration the purpose or the combined purposes. An 80% or greater density should be chosen for keeping fine snow, rain and high winds out. A 90% density will provide the highest rain deflection with the least amount of mist. With both densities, your outward view will be fine and high winds will be diverted. High quality shade screen has many attributes such as: providing privacy, reducing sunlight glare, or blocking heat and UV radiation. Shielding from rain, snow and high winds is an added benefit and sometimes the most important factor. By considering the priorities during both foul weather and fair weather, with a little compromise it is usually possible to arrive at a solution that will fulfill your needs. The versatility of shade screen with all its attributes and benefits can provide protection as well as bring a new meaning to the phrase, "living in the shade".